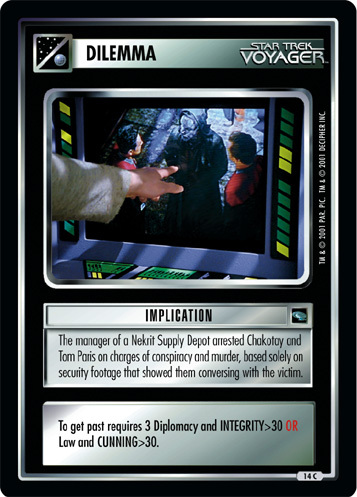 Tierna's "rescue" by the Voyager crew was part of an elaborate ruse. 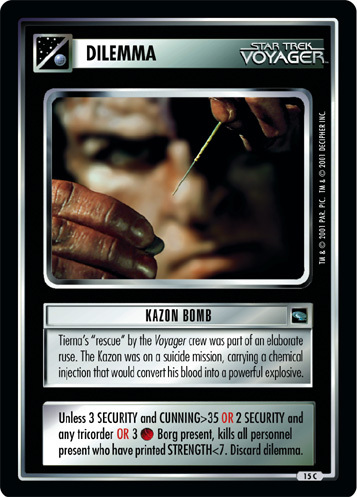 The Kazon was on a suicide mission, carrying a chemical injection that would convert is blood into a powerful explosive. Unless 3 SECURITY and CUNNING>35 OR 2 SECURITY and any tricorder OR 3 Borg present, kills all personnel present who have printed STRENGTH<7. Discard dilemma. Image Source: Voyager: "Basics, Part I"